As it turns out, those “transitory” inflation factors were worth only about 25 bps on the core CPI rate. This isn’t at all surprising and was as usual entirely predictable. But when you don’t have any answers there is a lamentable tendency toward denial or deliberate evasion, even if that leads toward the ridiculous. Base effects are a part of economics (small “e”). The real world isn’t smooth. The attempt to make it so is understandable but calculations will always be fraught with lumpiness. There is just no way around it. How we treat that unevenness does matter, however, demonstrating as always that interpretation is usually what’s at issue. Verizon Wireless entered the cellphone wars in March 2017; or, that’s when their rollout of unlimited data across their plans registered in the CPI components for wireless telephone services. The index for that small piece of the consumer “bucket” was 52.679 in February 2017 (not seasonally adjusted), then dropped to 49.002 upon the introduction of this actually transitory factor. After a couple of weeks of relative quiet on the inflation theme, it seems people the last few days are talking about it again. Big coverage in the Daily Shot about the underlying pressures. I don’t normally pay much attention to PPI, but it’s hard to ignore the momentum that has been building on that side of things. In particular, the medical care index that PCE uses has been rising rapidly in the PPI. Doesn’t affect us today w/ CPI but affects the Fed convo. But back on CPI. Of course the main focus this month for the media will be the dropping off of the -0.073% m/m figure from March 2017, which will cause y/y CPI to jump to around 2.1% from 1.8%. It’s a known car wreck but the reporters are standing at the scene. That year-ago number of course was caused by cell phone services, which dropped sharply because of the widespread introduction of ‘unlimited data’ plans which the BLS didn’t handle well although they stuck to their methodology. It would only take 0.22% on core to cause the y/y number to round UP to 2.2%, making the stories even more hyperventilated. I don’t make point estimates of monthly numbers, because the noise swamps the signal. We could get an 0.1% or an 0.3% and it wouldn’t by itself mean much until we knew why. But I will say I think there are risks to a print of 0.22% or above. First, remember the underlying trend to CPI is really about 0.2% anyway. Median inflation is 2.4% and after today core will be over 2%. So using the last 12 months as your base guess is biased lower. But apparel was rebounding from two negative months before that. We’re so used to Apparel declining but really last month just brought it back up to trend. And with the trade tensions and weak dollar, am not really shocked it should be rising some. Apparel is only +0.40% y/y, so it’s not like it needs to correct last month. On the other hand, OER decelerated to 0.20 from 0.28 and primary rents decelerated to 0.20 from 0.34, m/m. But there’s really no reason yet to be looking for rent deceleration – housing prices, in fact, are continuing to accelerate. 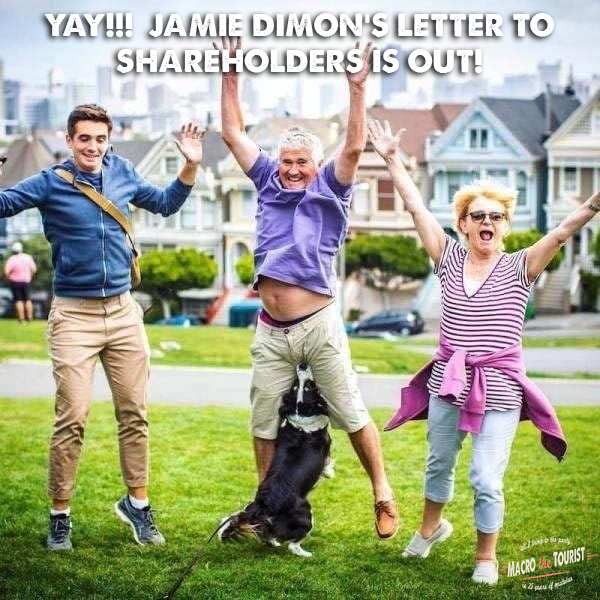 JP Morgan’s CEO Jamie Dimon has released his annual letter to shareholders. It’s actually interesting reading, and although at 45 pages it’s a little long, it’s probably worth a quick peruse. Dimon said it would be reasonable to expect a 10-year Treasury note yield of 4 percent with normal growth and inflation approaching 2 percent. The fact that the 10-year is trading closer to 3 percent is probably due to continued large purchases of Treasury bonds by the Fed, which are going to taper off. If inflation and wages grow at a faster rate than currently anticipated, “the Federal Reserve and other central banks may have to take more drastic action than they currently anticipate … reacting to markets, not guiding the markets,” Jamie Dimon said in his annual letter to the bank’s shareholders. The Producer Price Index is out for March and its feeling hot, hot, hot. “Core” PPI Final Demand is up to 2.7%, the highest since November 2011. This guarantees a rate hike from The Fed’s Open Market Committee (FOMC). PPI Final Demand less food and energy YoY is noteworthy since it is the highest since November 2011, shortly before Core PCE YoY hit 2%, the Fed’s target inflation rate. 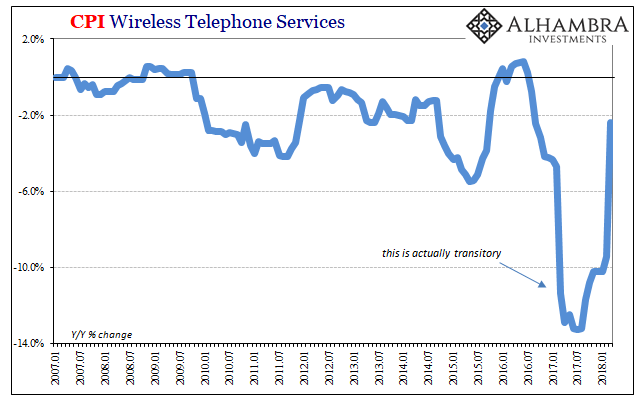 If we just look at PPI Final Demand, we see it is growing at 3% YoY and at the same rate as early 2012 when Core PCE YoY growth last exceeded 2%. Now that we can stop focusing on the imminent destruction of wealth in the stock market, for at least today (I am underwhelmed at the rebound on light volume), we can get back to something that matters: inflation. The chart below shows a straight, unweighted average of core or median inflation in the US, Europe, Japan, the UK, and China. (The chart looks similar if we only include the US, Europe, and China and exclude the recent ‘outlier’ Japan and UK experiences). We know that, in the US, measured inflation is going to be rising at least until the summer, as the one-offs from 2017 drop out of the data. The prior decline, and the current rise, obscure the underlying trend…which is for steady acceleration in prices. But it’s important to realize that this is not merely a US trend, caused supposedly by ‘tight labor markets’ or somesuch. It is a much broader phenomenon. The chart below shows four of those five countries. Okay, I get it. 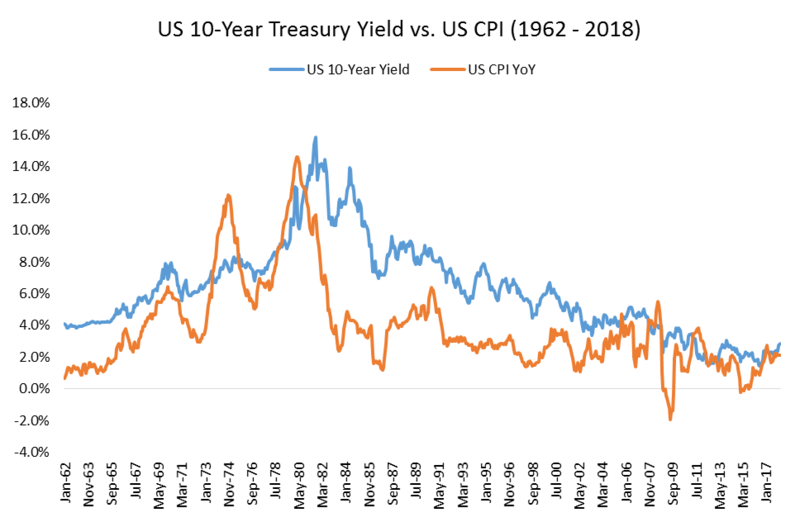 Your stockbroker is telling you not to worry about inflation: it’s really low, core inflation hasn’t been above 3% for two decades…and, anyway, the Fed is really trying to push it higher, he says, so if it goes up then that’s good too. Besides, some inflation isn’t necessarily bad for equities since many companies can raise end product prices faster than they have to adjust wages they pay their workers. So why worry about something we haven’t seen in a while and isn’t necessarily that bad? Buy more FANG, baby! Keep in mind that there is a very good chance that your stockbroker, if he or she is under 55 years old, has never seen an investing environment with inflation. Also keep in mind that the stories and scenes of wild excess on Wall Street don’t come from periods when equities are in a bear market. I’m just saying that there’s a reason to be at least mildly skeptical of your broker’s advice to own “100 minus your age” in stocks when you’re young, which morphs into advice to “owning more stocks since you’re likely to have a long retirement” when you get a bit older. Many financial professionals are better-compensated, explicitly or implicitly, when stocks are going up. This means that even many of the honest ones, who have their clients’ best interests at heart, can’t help but enjoy it when the stock market rallies. Conversations with clients are easier when their accounts are going up in size every day and they feel flush. There’s a reason these folks didn’t go into selling life insurance. Selling life insurance is really hard – you have to talk every day to people and remind them that they’re going to die. I’d hate to be an insurance salesman. Janet Yellen kept saying that inflation was just around the corner, but apparently she meant one of those long New York City blocks. The February inflation numbers are in almost exactly as forecast: According to the BLS, CPI MoM declined to 0.2% MoM while CPI YoY rose slightly to 2.2%. CORE CPI MoM fell to 0.2% while CORE CPI YoY remained level at 1.8%. Meanwhile, The Federal Reserve is merrily raising its target rate and letting its T-note portfolio mature in the face of whimpering inflation. OK, 15 minutes out from CPI. Exciting one after last month’s WTF print. Last month remember core CPI was +0.349% m/m, highest m/m in 12 years. 1.846% on y/y, so almost printing 0.4% and 1.9% which would have been emotionally challenging for the markets and Fed. For this month, 0.17% is rough consensus on core. For the economists. The Street is leaning short of that number. The story is that last month’s CPI was pulled higher by one-offs. But some of those things they think are one-offs, like Apparel, weren’t. They were reversing previous one-offs. Maybe some of them were, but I don’t see many. I think another 0.3% is unlikely but the market – both bonds and stocks – would react extremely poorly if we got it, even if it was just rounded up to 0.3%. Anything 0.18% and higher will cause y/y core to tick up to 1.9%. To go to 1.7% you’d need 0.07%. So bigger risk of an uptick. At some level this isn’t really a risk…it’s going to happen over next few months anyway. Mar-July 2017 was 0.9% annualized on core CPI. This month we’re watching apparel of course (+1.66% m/m last month). Also used cars & trucks, which everyone thinks is going down but I think is still going up. And medical care, which looks a little like it might be hooking higher but has a long way to go. Hospital services is one place we could see mean reversion. If I made point forecasts, I’d probably be roughly on consensus. But I don’t. I spend my time thinking about risks. …and while some of the risks to the consensus are lower, they’re already incorporating some mean reversion. Underlying pace of inflation is ~2.4% ex- the one-offs, so 0.17% is a bit below the ‘natural’ current run rate. And as I said the Street is leaning shorter than that. Going into the number, 10y Treasury yields are -1bp, Breakevens +0.25bp roughly, S&P futures +4.6. Well 0.18% on core m/m, and 1.857% on y/y. Those economists are goooood. But that’s above where traders were looking. Last 12 months. This does make the slope look less scary. Two words often heard in conversations about the bond market. Because bond investors tend to demand higher yields in periods of higher inflation and lower yields in periods of lower inflation or deflation. Looking at a long-term chart of yields and inflation, the relationship is clear. Data Source: Federal Reserve Economic Data (FRED). Not as clear from this chart is how bonds have actually performed during various levels of inflation. What has been the best environment for bond investors historically: high inflation, low inflation, or something in between? To answer that question, we need to take a closer look at the data. I would like to take you back to 2012. Just a few short years after the soul-searching-scary Great Financial Crisis of 2008-9, market participants had finally given up their worry of the next great depression enveloping the globe, but had replaced it with an equally fervent fear that inflation would uncontrollably explode. The Federal Reserve had recently completed their second round of quantitative easing, much to the chagrin of a large group of distinguished economic thinkers who had gone as far as writing an open letter to the Fed Chairman pleading he reconsider the program. What these unusually weak productivity estimates lean toward is, quite simply, the possibility the BLS has been overstating jobs gains for years. In early 2018, there is already the hint of just that problem in a 4.1% unemployment that doesn’t lead to any acceleration in wages and labor income. What it does suggest is that something (or several somethings) in these estimates is off somewhere. 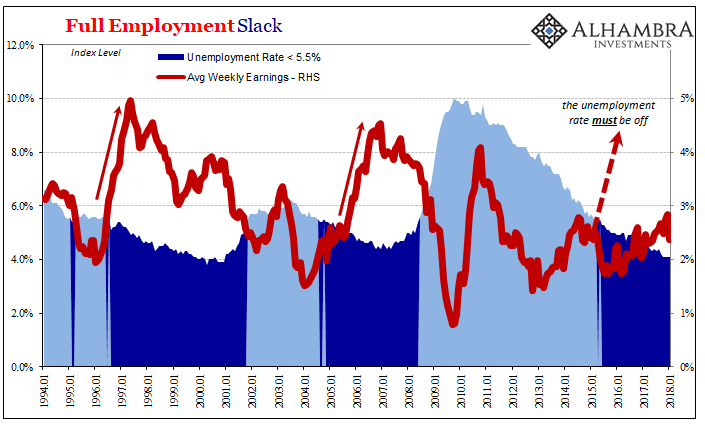 For the unemployment rate, that already includes the participation problem in its denominator, but, again, that is not mutually exclusive of problems in the numerator (the increase in the number of payrolls). As nothing more than a rhetorical exercise utilizing nothing more than back-of-the-envelope counterfactuals (so take it in that spirit), if productivity had been more balanced and thus more consistent with how an economy actually works over the intermediate and long terms (not transitory), that would have meant by simple arithmetic either output was much higher or labor input much lower. The Household Survey gained 1.44% per year during those same years, a lower rate than total hours worked reflecting the increase in full-time jobs as some part-time positions were converted back to the former pre-crisis status. 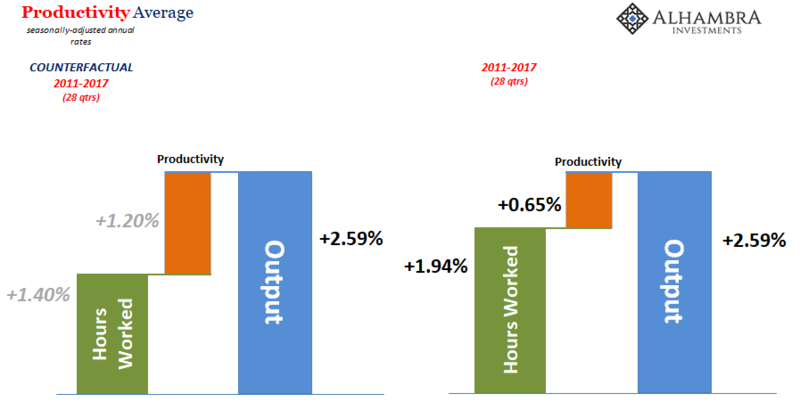 Reducing the total gain in hours worked by more than a third (as shown above) would have lowered the increase in the Household Survey by more than 5.2 million at the end of 2017, leaving out how in every likelihood the reduction would have been more severe factoring less part-time jobs conversions.